Isn't that still just the cutest little silly happy bunny ever?!? School. The resolution is good at 500 dpi, which means you should be able to zoom in close enough to recognize faces. 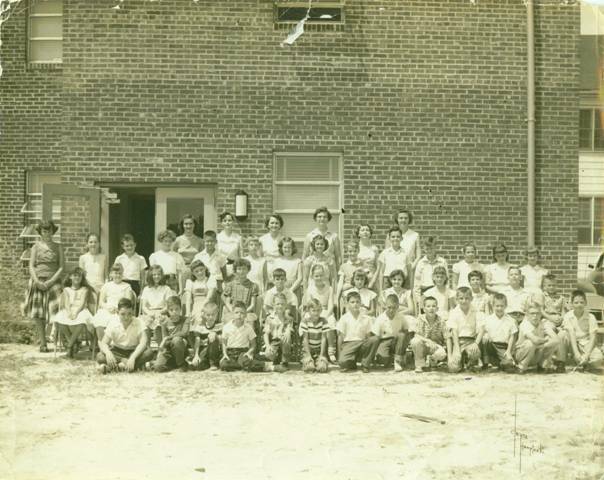 I was probably in the third or fourth grade, so it was taken in 1955 or 1956. Many of the kids can be recognized. right end. I’m sure there are other NNHS alumni in the picture, but I can’t recognize any more. Baker's, Gillis', and that’s all I can remember right now. This would have been in 50's and 60's. blessedly left intact, so y'all write in and let us know, please! Salad, Sour Cream Pie, ice cream, and lemonade. There may have been more; I don't remember. As a matter of fact, I'm too tired now to remember much of anything - even how to giggle - so I'm going to go fall into bed now. There will be more surprises tomorrow.